So, I’m going on a hike in 3 weeks. Not just any hike. This hike is 16 miles total: to climb Half Dome in Yosemite and back to the trail head. When my brother offered me this opportunity, I didn’t hesitate to say “yes”. I am thrilled to see God’s handiwork from that lofty view point! At the same time, it is daunting to think I will carry my pack of supplies and climb to over 8000 feet! I’m 52. I live in Houston. It is sauna – I mean summer. There are no mountains nearby to “practice” hiking for the altitude. Did I mention I’m 52? I haven’t done any serious hiking since I was 16. My heart and soul keep thinking of the communion with God during the hike: no TV, cell phone, ipad, etc to interrupt. Just hiking with God as my tour guide. It’s pretty awesome to be able to do this with one of my brothers – they are ALL older brothers. If he can do it, so can I. Selfie stick photo at the summit? Maybe not – I’d have to carry it the whole way. Did I mention I’m not a serious hiker? So all these thoughts are running through my brain, but how do I train? My brother is retired. He can hike 13 miles a day. I go to work for 6 hours of daylight. Did I mention it is summer in Houston? What to do, how to train, how not to die from the heat? I purchased the necessary equipment and borrowed a few things. First, break in the hiking boots. Check. Next, I put bottles of water in the backpack. Check. Find a good friend who will walk with me at 6 A.M. while I look like a homeless woman carrying her life’s possessions – and walking 2 dogs. Check. Add more weight to the classes at the gym. Check. Next, take backpack and hip-pack (btw: loaded) spend 1 hour on the treadmill or stair-climber before class at the gym. Check. Did I mention I’m 52? OK, I’ve done that and I can still move! Ask same good friend to walk inside (sans dogs) at the local hospital’s inner mall. It’s air-conditioned. Check. “Dear God, please don’t let me have an injury from training! I SO want to make this trip.” This has been my process. I know I can talk with God anywhere, anytime. Life can be busy and distracting. Reconnecting with Him while in nature is restorative, at least for me. It reminds me that He takes care of the birds and He takes care of me and my family. It gives me time to peel back the layers of everyday stress. So, my countdown has begun. I leave in 18 days. I have several theme songs: Superchick- “Go One More”, Tobymac – “Give Me That Funky Jesus Music”, and the song lyrics “put one foot in front of the other, and soon you’ll be walking cross the floor, put one foot in front of the other, and then you’ll be walking out the door” (from a Christmas kids’ special). 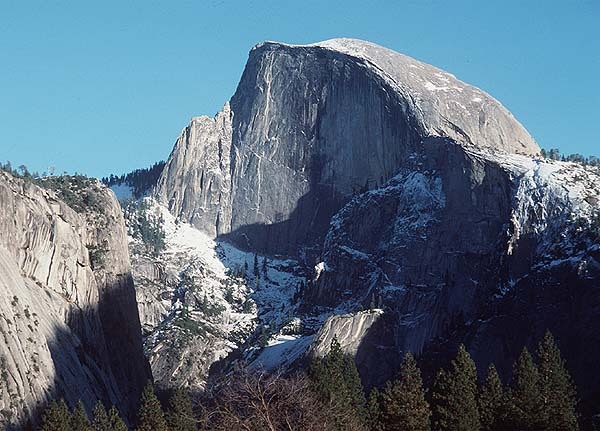 For now, I am still 52 and going to hike Half Dome. Stay tuned for the aftermath! ← Pruning is good for me!